Cupcakes-Birthday Cakes-Wedding Cakes-Speciality Cakes and MORE! Who is JK Sweet Cakes? JK Sweet Cakes is an independently owned cake shop in Johnson City, TN. Owner Jenny Kilbourne has been in the cake bussiness for over 10 years and finally got the courage to quit her full time job to see if her side business could take off! Jenny loves to create all sorts of cakes and accepts any challenge you might have for her. JK Sweet Cakes offers everything from personal confections to specialty orders for parties, events and weddings. JK Sweet Cakes caters to the needs of customers by being attentive, knowledgeable and ready to answer any and all questions you may have. 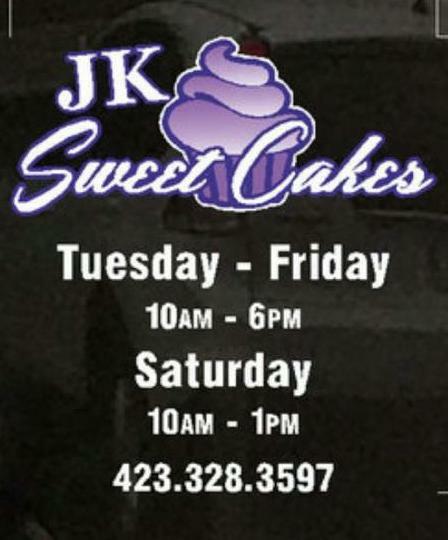 Come by today and see why so many Tri Cities residents are hooked on JK Sweet Cakes!